Is it time to head for the exits? Altair Asset Management made headlines this week with its decision to liquidate its portfolios, reasoning that it intends to avoid a market crash. Altair’s bold move came in the midst of a growing media focus on the extent of overvaluation – and potential risk – in asset markets, including equities, property and collectibles. The question is: how overpriced are equities, and what is the best strategy to adopt right now? Investors in the Montgomery and Montgomery Funds will know that we have been amongst the many fund managers bemoaning the difficulty in finding good businesses trading at attractive prices. Finding good value to be scarce, we have lifted cash holdings to relatively high levels. Given the actions of Altair, a good question is: “have we done enough?”. In the case of The Montgomery Fund, we have a soft limit of 30% cash, which we currently sit close to, but scope to move to 50% cash where we are extremely concerned, so there is capacity to do more. The Montgomery (Private) Fund has the ability to move to 100% cash, but currently sits more than 50% invested, so there is ample scope to do more there as well, so, why haven’t we? There are a couple of charts that will help in exploring this question. Firstly, the chart below plots an indication of relative value for Australian equities over the past decade (in this chart, lower=cheaper). 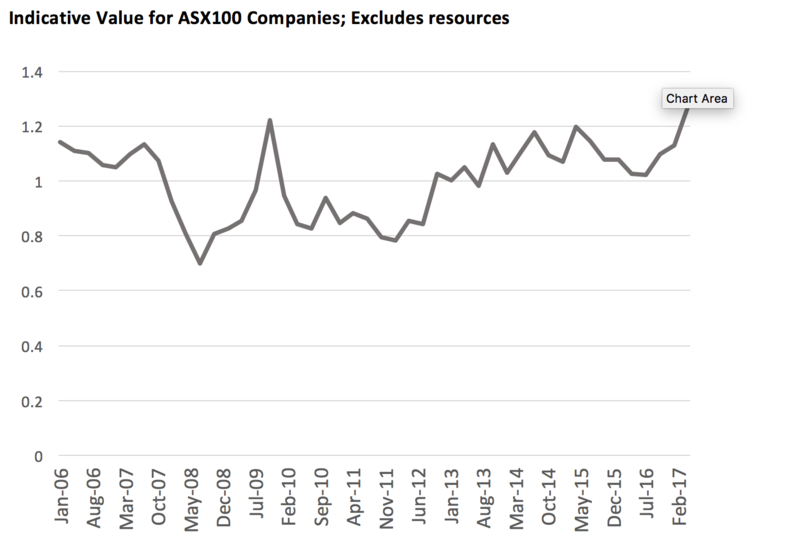 We have prepared the chart by applying an automated valuation algorithm to ASX100 companies at quarterly intervals. Given we are quality-driven investors (and find resources very difficult to value), we exclude resources businesses from the analysis to get a better read of the universe of companies that is most relevant for us. There are two things that might be drawn from the analysis. Firstly, in early 2017 we find ourselves in a market that looks expensive relative to this recent history, and some degree of caution is clearly warranted. The second thing that may be drawn from the chart, however, is that this position is not extreme. While we are scaling new highs, these are not dramatically different to the position we have seen in recent years. Accordingly, on the basis of valuation relative to the past decade, there are certainly grounds for caution, but it is not clear that we should be assuming the brace position. The next chart plots the Cyclically Adjusted PE Ratio (CAPE) for the US market, using data from Robert Shiller’s website. This time series is interesting because it allows us to see back as far as the late 1800s, and being based on ten-year inflation-adjusted trailing averages, it removes some cyclical “noise”. When we look at this analysis we again find a market that looks expensive, and this time the picture is a little more dramatic. 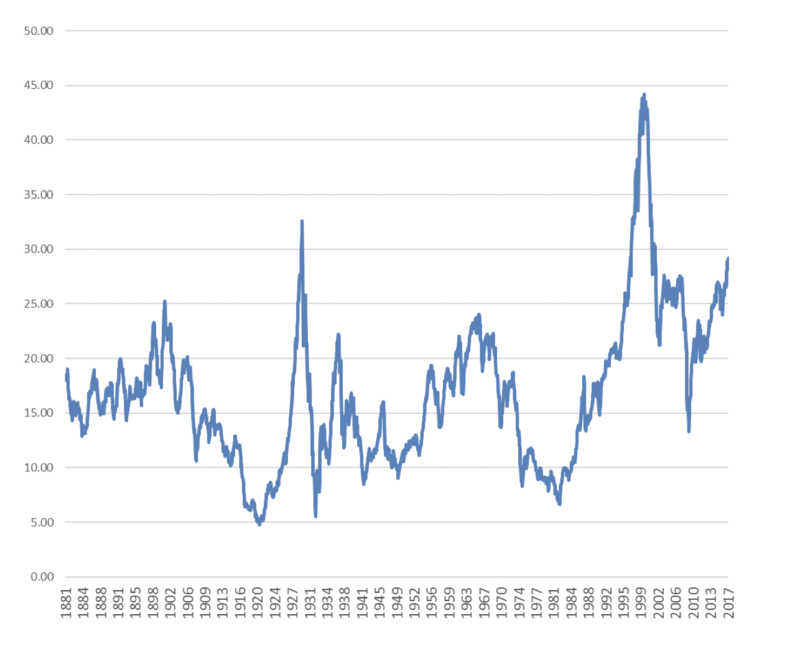 Only twice in its very long history has the Shiller CAPE been above the current level. On this basis, it may well be prudent to at least consult the safety brochure to familiarise ourselves with the brace position. However, there is an important, and less-obvious qualification to this. If you look closely at the Shiller CAPE you might notice that there appears to have been something of a regime change. Prior to 1994, a CAPE above 20 looks to have been the level at which valuation became a concern, with the market having been below that level almost 90% of the time. Since 1994, however, things have been quite different. In fact, during this period the CAPE has been above20 for more than 90% of the time, and even in the depths of the GFC did not approach the low points seen regularly during the earlier period. An investor who framed their equity allocation decisions around CAPE being mean-reverting would have endured very poor results in these recent decades, having exited the market at what turned out to be a low point in 1994, and probably not seeing enough value even in the depths of the GFC to again be fully-invested. We might construct various theories for why this series looks the way it does, but to me there is one simple and important lesson to take away: Value might be a very logical input into allocation decisions, but our ability to forecast the future behaviour of asset markets is far from perfect, even over reasonably long stretches of time. So, while the apparent lack of value on offer today gives us good grounds for concern, we need to recognise that a sharp market pullback is by no means guaranteed, and that continued good returns from equities for years to come is well within the realms of possibility. If you know for certain that your team is going to win the grand final then it makes sense for you to bet the house on it. If you don’t know for certain then a more measured bet is the better course. We can see real reasons to be cautious of equity markets today, and holding a meaningful level of cash seems entirely appropriate, but we can’t make a case for betting the house on it.